A quick and easy way to shell mature peas, cowpeas, or blackeyed peas. 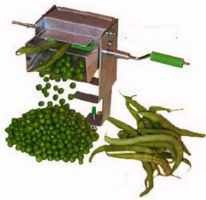 Peas are squeezed from the hulls, so it should only be used with mature peas. Doesn't spatter, and the peas roll into your bowl or pan, allowing you to watch for any foreign matter. You can process a bushel of peas in a half hour. This unit can be used manually with the handle, or with a portable mixer. The gears and bearings are made of nylon and the unit is constructed of steel for long life. Unit measures 4"x8"x8"